Goldman Sachs has produced, for the Australian market, a very interesting table which compares the performance of the main asset classes. As can be predicted, every year produces a different result for which asset class out-performaed the others. For example, in 1995, ’97, ’98 and ’99 International Shares were the best performer, but in 1996, 2000, ’01, ’02, ’03, ’09 and ’10 International Shares were the worst performer. Likewise the returns can vary significantly. 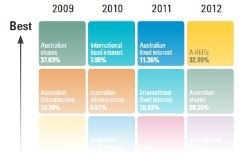 In 2000 Australian shares produced a whopping 46.24% return whereas in 2008 it was a depressing -13.56% return. Whilst the average returns are interesting they are also very general; your portfolio will be affected by when those returns are received. Sequence Risk is explained by Investopedia as “It is not just long-term average returns that impact your financial wealth, but the timing of those returns.” The average return does however let us see that Australian Shares returned nearly double what cash did over the last 18 years and the Goldman Sachs table shows us that Cash has never been the top performing asset class over the last 18 years. If you’re able to turn on a computer and read this then hopefully it’s not required for me to state that past returns are no indication of future returns so please don’t take this as a guide of what to invest in. Rather understand that different assets perform better at different times which is why most investment professionals espouse diversification.